Jim and I are in the booth early this morning… Probably a little too early, but what the hell! Our good friend from All Around Perfmance Horse, John Klam got in last night and we ate and had a couple beverages. As usual we solved some world problems and made some predictions of the outcome of the finals. It’s good to be here again and we are eager to see all our friends and make new ones. We made a new friend yesterday in Lawton, OK after spending the morning hanging out at Howard Council’s saddle shop. 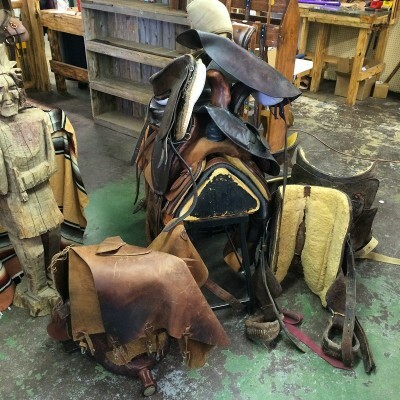 When it comes to saddle making careers, Mr. Council’s is by far the greatest. He has built saddles for over 250 NFR qualifiers and it was a true pleasure to spend the time with him. Nine days of team roping and lots of money given away. If your around come by and visit. If not we will post frequently and fill you in on the excitement. We at DG Saddlery would like to thank all those who attended our 3rd annual DG Saddlery Team Roping in Caldwell, TX this past weekend. We had 491 teams for the day and enjoyed spending time with all our friends and making new ones. Congratulations to George Mueller for winning the high money of the day and a certificate for a custom saddle! We look forward to working with Mr. Mueller designing his new custom Don Gonzales saddle! We hope everyone enjoyed our roping and for those that didnt get to make it this year, we will have another one next year and we hope to make it bigger and better than is year. Also if you forgot to purchase your DG Saddlery tshirt from the roping we have them available at the shop or you can contact us through the our website DGSaddlery or call us at 979-775-6300. Thanks again and we hope the rest of your team roping season goes well. Come see us in Waco, TX this weekend! This weekend is the Big Loop roping in Bryan, TX at the expo center. We have been on the road for two weeks straight and now we will set up our booth here at home in Bryan. For all the ropers who are coming to the roping good luck and be sure and come by the booth for some great deals and see some of our new stuff. And for the ropers trying to decide where to go this weekend, the Big Loop is your best option… Don’t miss it come out and rope at one the best ropings available today. I’VE HAD IT!!! Spending the day cleaning and getting ready for another great week of slinging leather. The one thing that is for sure is that we are pretty close to needing more space. We are doing our best with the space we have and as with most businesses, if they are lucky, they grow in production and need more space. Although our workspace is tight and old, we will continue pushing onward and deal with our issues. If anything it adds a sense of great comedy to our day in day our work life. Blessed to have the pile of work that we have and blessed to have the sense of humor to enjoy it all. After all, what is a saddle shop with out character. Ya, that’s what I call it, character! Those that work for me have become quite capable of dealing with the unconventional working environment, and we all patiently wait for the day when ample workspace will be a reality and coming from such sparse beginnings will keep us humble. The flip side is we could have a big fancy building and nice big retail floor with no work… I prefer our current situation. The 2011 George Strait Team Roping Classic is one of rodeo’s biggest event and winning it is an accomplishment that all ropers dream of making. We want to thank all those that came by our booth at the event and hope to see them at our next event. This was our second year and we plan on making it a yearly tradition. Please visit our website DGSaddlery.comfor more information about our saddles and to stay connected with us on Facebook. We have a booth at the George Strait team roping this weekend and look forward to seeing our customers. Come by the booth and see some of our latest work. There will not only be saddles in our booth, but also in the arena. Watch some of the best roping and see what the best ropers are riding.